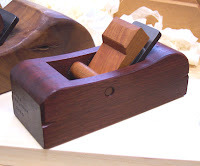 I learned to make handplanes from David Finck and Tod Herrli. David makes planes in the Krenov style and has written the best book on plan e making available. 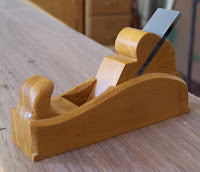 Tod is a master of making moulding planes and panel raisers. The panel raiser class I took from him at Olde Mill Cabinet Shoppe was four exhausting 10-hour days and worth every second. While I still am not able to achieve the "perfect shaving", all of the planes I've made at least produce a shaving that you can read through. Of the woods I've used to make the planes, bloodwood, osage orange, and beech have worked the best as far as durability (not wearing from use) and holding a sharp edge (meaning, when shaping the planes themselves, a cut into the wood will produce a crisp, clean edge). Applewood smells like cider when you cut it, but the wood moves a lot and I have to re-flatten the sole twice a year. Maple's great, just kind of boring.